When it comes to your home’s roof you’ve got loads of choices for getting a new roof installation. 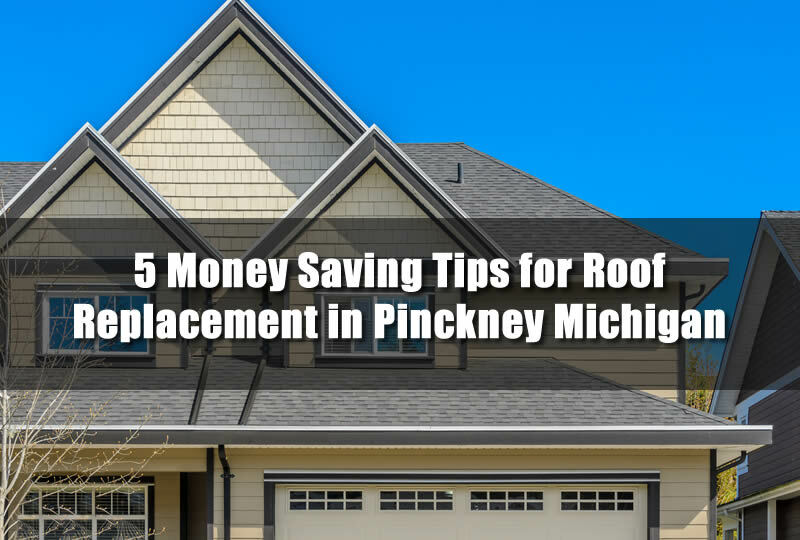 Some of these options can actually save you money when getting a roof replacement in Pinckney Michigan. I’l go over some of the ways these tips can save you money and also lots of frustration as well. As always, when you have roofing problems and you need roofing help be sure to call us for a roofing contractor in Pinckney Michigan and surrounding areas. Getting a bit of savings on your home’s roof doesn’t mean you’ll skimp on quality. Many of the tips below will still give you a quality roofing project and protection for your home. The tips are just designed to help you better understand your roofing choices and also how it may affect the total cost of the project. At Livingston Roof Pros we are a fully licensed and certified roofing contractor in Pinckney Michigan. There are lots of reasons why this is important but perhaps the most important of these reasons is that your roofing materials will be installed correctly. Most roofing materials manufacturers will offer warranties on the roofing products that are installed and purchased from them. However, even if this warranty was given to you if you don’t have the roofing materials installed correctly and by properly qualified roofing contractors it may in fact, void the warranty of your home’s roof. So in a short time the roof fails if you don’t use a qualified roofing contractor you may end up paying for an additional roof for your home. That’s why it’s so important to always use a properly qualified and licensed roofing contractor in Pinckney Michigan. Sometimes home owners will offer to get permits and schedule any type of inspections needed when getting a new roof installed. However, at Livingston Roof Pros we can handle all of this for you. It reduces confusion and scheduling conflicts which may otherwise stop progress on the project. Plus, you don’t spend money on permits that you may not need and saves time at the local permit office as well. For asphalt shingle roofs the type of roofing method can decrease the price. There are two types of roofing methods that you can choose from. The first roofing method is called re-roofing and it’s done to save money on your home’s roof. Re-roofing is done by simply adding another layer of asphalt shingles on top of the original layer of asphalt shingles. The labor costs of removing the old roof are eliminated and also some of the clean up costs are lowered. A home can be re-roofed once and can only have two layers of asphalt shingles total. Three layers of asphalt shingles are typically too much weight. The other roofing method which is a bit higher is called tear off and replacement. This is a labor intensive process in which the roofing materials that are currently installed on the roof are removed before the new roof is placed. There are some advantages of using tear off and replacement and it’s usually more expensive than re-roofing. In addition, there is more debris that will need to be removed and can raise costs more. In order to determine some details about your roof and identify problem areas it’s important to get a roof inspection done first. By having a roof inspection you can get a better estimate on the roof replacement in Pinckney Michigan. You may be able to get a simple roof repair done to correct the problem you are experiencing with your home’s roof. An inspection can help you better understand the process of getting a new roof as well. Sometimes paying a little more to get a better quality roofing product is worth it. Roofing material warranties can now last for more than 50 years offering a chance to protect your home for the next 5 decades versus the 20 years or less for a lower quality product. Factor in the time the roof will be installed and you can make out better using higher quality products. Ready to get started on your roof replacement in Pinckney Michigan? Give us a call now and get a free roof estimate for your home.